(PD) Photo: Detroit Publishing Co. The quake's magnitude was about 8 on the Richter Scale. Its epicenter was 2 miles west of San Francisco in the Pacific Ocean. The San Francisco earthquake of April 18, 1906, together with the resulting three-day-long fire, was one of the deadliest and costliest natural disasters in U.S. history. Between 1,000 and 5,000 people died (not counting fatalities from subsequent epidemics)  and physical damage was estimated at $500,000,000 in 1906 dollars -- the equivalent of many billions of dollars today. Its magnitude has been estimated at between 7.7 and 8.3 on the Richter scale; at the surface, the ground moved from 8 feet to 28 feet (about 2.5m to 8.5m). At 5:03 on the morning of the quake, the steamship National City, 87 miles north of San Francisco and 29 miles offshore, felt a sudden upward motion, then a trembling and a forward jolt. Seven minutes later, in San Francisco, the ground thundered. Eyewitnesses saw huge waves in the ground. A police officer reported a rotary motion which caused part of a building near him to fall. A mile west of him, at City Hall, the shaking of the ground began at 5:10 in the morning. To the east, on the other side of the bay, it began at 5:12 in the morning. At the Palace Hotel, the famous opera singer Enrico Caruso woke thinking at first he was on a ship at sea. After the hotel was evacuated, it burned to the ground. The thundering in the ground traveled southeastward getting weaker. It was centered along the San Andreas fault and reached Palm Springs. The earthquake was more severe north of San Francisco than south of the city. To the north, most of Santa Rosa’s brick buildings collapsed, its wooden buildings slid off their foundations, and then grape arbors in the countryside were seen rising and falling on waves of earth. By 5:12 A.M., the official time of San Francisco’s experience, the epicenter was at a point on the San Andreas fault about two miles south of the city, at Mussel Rock, which became a tourist attraction in a park. The shaking of the ground caused underground water pipes to break, as one man found out when he tried to take a bath. The telephones stopped working. Electricity wires fell. Gas pipes broke. The shaking caused some of the buildings to collapse, or parts of them. Some of the buildings were dynamited to help make firebreaks, for by midday there was a wall of flame a mile and a half long moving northeastward and then westward in the city. The fire was contained in the northeast of the city and burned until it ran out of flammable material three days later, when it rained. 225,000 people had become homeless. Mayor Schmitz ordered army troops to kill looters. He telegraphed the mayor of Oakland for help and then the governor of California. General Funston sent cables to the War Department in Washington. After the fire was out, the homeless were put in tents sent by the army. These towns had the word camp in their names. A few moths later, the tents were replaced by small green cottages which were inhabited for several years. People continued their habit of going to work. Yet, five months later, most of the debris remained where it had fallen. People spent less, saving their money. Insurance companies couldn’t pay in full. The city told insurance companies and other investors that lack of planning had caused “the fire” and that the city had learned its lesson. The stock market went down as insurance companies tried to pay. Twelve insurance companies went out of business, their stockholders having lost their wealth. One insurance company reopened, giving its policyholders shares of stock instead of money. A committee of white citizens tried to force the Chinese residents of the destroyed Chinatown neighborhood to move to a location southeast of the city. Empress Dowager Cixi of China, however, insisted that its former residents be allowed to rebuild in the original location, and refused to sell the Chinese government's property on Stockton Street where its consulate had stood, pledging to rebuild it on the same spot. Faced with possible disruption of U.S.-China relations and trade, the committee backed down. The business of making movies grew in Los Angeles rather than San Francisco, possibly because of the earthquake. The relatively new Pentecostal religious movement rapidly gained momentum when it interpreted the earthquake as the "wrath of God" punishing the "wicked city" of San Francisco. Politicians used the loss of documents in the fire as a reason to worry about illegal immigration. Most of San Francisco’s poets, writers, composers and other artists, many of whom were part of the so-called Bohemian movement, left the city, which ceased to be a major center of artistic creativity until the rise of the Beat movement in the 1950s. The city council’s plan to bulldoze through neighborhoods and businesses to make wide boulevards radiating from city hall, large houses, parks with fountains, and a marble subway was forgotten. The science of architecture learned from what happened, improving fire protection systems and the strength and flexibility of buildings. Scientists became more interested in studying earthquakes. 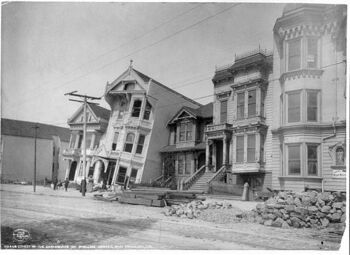 The City of San Francisco planned how to respond to future earthquakes, and scientists began looking at possible early-warning signs such as increases in micro-earthquakes. ↑ U.S. Geological Survey, "The Great 1906 San Francisco Earthquake: What Was the Magnitude?" http://earthquake.usgs.gov/regional/nca/1906/18april/magnitude.php Retrieved, April 6, 2011. ↑ U.S. Geological Survey, "The Northern California Earthquake, April 18, 1906," http://earthquake.usgs.gov/regional/nca/virtualtour/earthquake.php Retrieved, April 6, 2011. ↑ Philip L. Fradkin, The Great Earthquake and Firestorms of 1906: How San Francisco Nearly Destroyed Itself (Berkeley: Univ. of California Press, 2005), pp. 188-191, 345-346. ↑ U.S. Geological Survey, "The Great 1906 San Francisco Earthquake: How Large Was the Offset?" http://earthquake.usgs.gov/regional/nca/1906/18april/offset.php, retrieved April 22, 2011. ↑ U.S. Geological Survey, "The Great San Francisco Earthquake of 1906," http://earthquake.usgs.gov/regional/nca/1906/18april/ , retrieved April 22, 2011. ↑ U.S. Geological Survey, "The Great San Francisco Earthquake of 1906:1906 Marked the Dawn of the Scientific Revolution," http://earthquake.usgs.gov/regional/nca/1906/18april/revolution.php, retrieved April 22, 2011. This page was last modified 15:27, 26 April 2011.